America - refurbished production facility in 40-50 year old building. Production workers wear hairnets and street clothes (sometimes a lab coat). Standard air conditioning. China - workers pass through a gowning area where they put on sanitized jumpsuits, head coverings, boots, gloves and masks. Pass through a blow-down airlock (high pressure air spray to remove dust/hair), then into the production area that is brand new (3-5 years) designed for the production of personal care products, cleanable walls, ceiling and floors, well lit, and amazingly clean. Positive air pressure in production rooms to keep 'dirty' air out. An amazing difference...and this is for a typical personal care product. State of the art equipment and a high dedication to high quality products. Now don't get me wrong, I did see stereo-typical 'sweat shops' in China....rows of people hand painting Christmas ornaments or folding necklaces into gift boxes, etc. 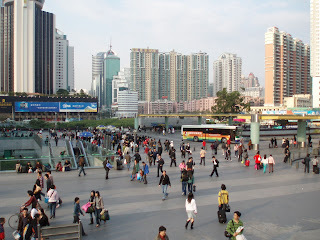 Average worker in China makes about $300-400 a month, but they do typically get free room and board from the company, as they live on site in dorms. Work 12 hr shifts 5-6 days a week as well. Anyway, the trip in China went well. 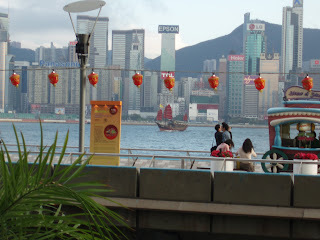 Spent a day in Hong Kong (very much like NYC)...visited the night market and picked up some more trinkets for the kids. Not any luck in jewelry for Jen, so I guess I'll make some jewelry store in the states happy with a nice gift when i get home....she has earned it in spades after the three weeks of me travelling. We're in Frankfurt, Germany now. Spent yesterday at the Ambiente Home Fair yesterday. Largest international home furnishing, decorating and such show in the world. It is huge!!!! And my feet are feelin it this morning. Anway, dawn is breaking here in Frankfurt and I need to hit the shower to get ready for breakfast. More info later today on what we're doing here in Germany. 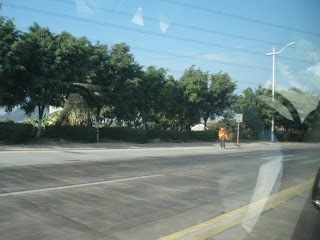 Street Sweeper in China...Govt job to hand sweep the highway...and you think your job is bad??? 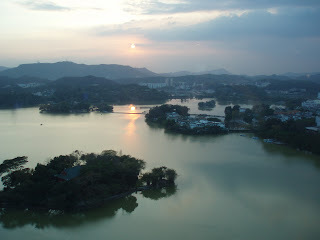 Sunset in ShenZhen overlooking a lake outside the hotel. Quick update before I hit the shower and get going for the day of auditing. 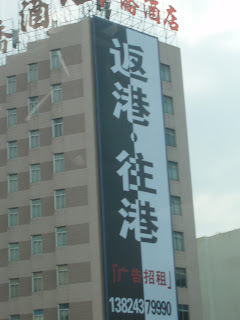 No significance to this pic....just a neat advertisement on the side of a building here in ShenZhen. 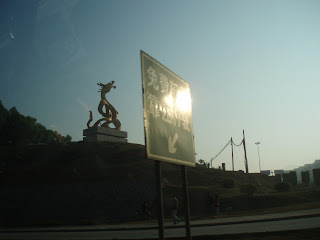 This is a pic from outside the local shopping market/mall. Similar to a flea market in the states, except with twice the number of people and shops, as well as the constant barrage of 'runners' that try and intice you to come into their shop. They hand out business cards for various shops in the store, all of which are pretty much selling the same things, watches, bags, electonics, DVDs, etc. Did pick up some papercuts and hand painted glass baubals for the kids that I hope they will like. 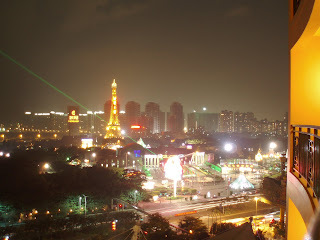 Here is a shot from Sunday night from the hotel balcony...laser show and lights from the 'Windo of the World' park across the street. They were playing the Star Wars theme which attracted my attention from the hotel room. Had a huge fireworks show afterwards. Not much else to note from the weekend. Dinner here in the hotel and then an early night to get ready for today. Super Bowl starts in about 30 minutes for everyone in the states, but I'll be in a car to a supplier. I'm rooting for ther Colts in the game, as I think the Bears are a bit overrated and Manning is due to win the big one. ttfn. Not sure if you can see from the pic, but there is water visablein the distance, in addition to some mountains....very pretty. Finally able to unpack the suitcases, as we'll be here for a week as we visit a number of local suppliers for the next 7 days before heading to Germany. Planning on a nice Italian dinner here in the hotel later tonight. Our rooms come with free mini-bar and happy hour drinks on the executive level (concierge level in the states), so that will be a nice unwind every evening. Take care all, and I'll update again over the weekend after we've had some time to do some sightseeing. Unlike US airline travel, there is no organization for boarding an airplane in China. They announced boarding and everyone headed for the line and onto the plane. Once on the plane (booked to capacity I might add), the Chinese don't have any issues with sneezing, picking, coughing, and hacking in public....in fact, I had not realized that the airsick bags were also available to catch anything that one might cough up.....what fun. 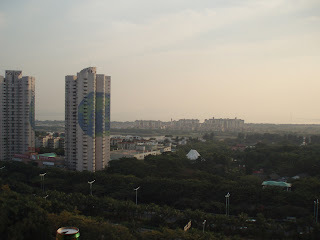 No headaches to speak of, flight was uneventful and our hosts picked us up at the local airport. 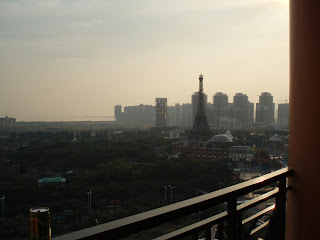 The hotel here in Changzhou is AMAZING....4-5 star hotel for $80 a night. 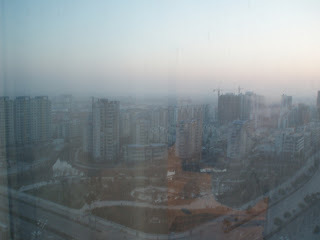 Huge room on the 19th floor gave me this view when I wake up in the morning. Spent last night at a Karaoke club with our hosts. I refrained from starting an international incident by staying away from the mic and just enjoying the company and a few beers. Slept well last night and conducted an audit today at our wallflower manufacturer. Everything went well. I really have enjoyed the trip so far, especially the dining experiences. Had a great Indian meal last night and then a very good traditional Chinese meal today for lunch. 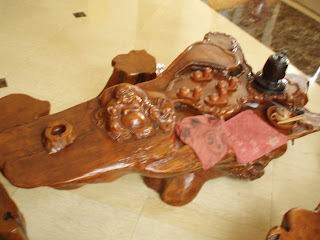 Everythign served family style on a lazy suzan that allowed everyone access to whatever they wanted. I am slowly progressing with my ability to use chop sticks for dining, which gives some additional entertainment value to the meal for everyone else as they watch me try and eat. Also tends to slow down the meal, so I've noticed that I don't eat as much, which is always a good thing. 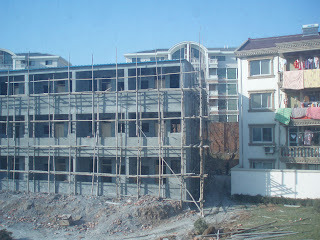 Scaffolding in China is made from tied together bamboo....this is a picture of some dorms that the company we visited today is putting together for their workers that live too far to communte and want to stay close enough to do the work. Anyway, time to get some work done and get ready for dinner.....mmmm .....seafood. Will post more later...We're headed to Shanghai early in the morning (3 hr car drive) to make a 12pm flight to Shenzhen where we'll be staying for the next week. Not sure when I'll get to update again, but will on Saturday for sure.